There aren’t many municipalities that have a bridge named after them. But sometimes you can get lost in the shadow of a bridge. For a long time Bayonne has been the place on the Hudson that has not delivered on the promise of the “gold coast.” While the cities to the north have capitalized on their waterfront location, transportation, and access to Manhattan, Bayonne has been unable to take advantage of prior economic booms. 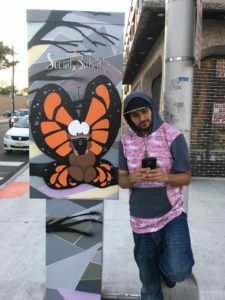 Social butterfly street art at 23rd Street and Broadway in Bayonne. That has all changed over the past several years. Development has finally rediscovered the peninsular city. Home to the famous Bayonne Box, the city is filled with one- and two-family homes that make up the backbone of the town. Unfortunately, the city also has its share of outdated and abandoned warehouses and commercial storefronts. These sites are now fertile ground for the new buildings that are leading the city’s revitalization. And, as luck would have it, these sites are located adjacent to several light rail stations. Bayonne is finally on its way to creating a modern town center. Ground Zero in the redevelopment is the 22nd Street light rail station. The area is home to Silk Lofts, a converted factory that now houses spacious lofts. It is also the place where three separate multi-unit buildings are under construction, only steps from the light rail. Four more projects are in the design phase and are expected to begin construction next year. On Broadway, empty storefronts have been replaced by a modern emergency room and medical offices operate by St. Barnabas. The facility also incorporates a 100-space public parking garage. As a result the sidewalks have been widened to promote pedestrian safety and to accommodate the city’s new bike share program. 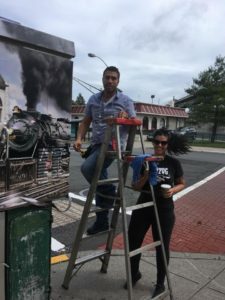 Painting a locomotive on an old utility box in Bayonne. Nearby, plans have been approved for the transformation of the McDonald’s. The site will have expanded sidewalks along with a public plaza that can host community events. Local businesses have also joined the movement by reinvesting in their properties and their enterprises. New restaurants have opened in anticipation of the additional residents. Old mechanical utility boxes on city corners that previously attracted graffiti have now become canvases for local artists. The city has also purchased bronze statues , which will be placed this spring on Broadway. 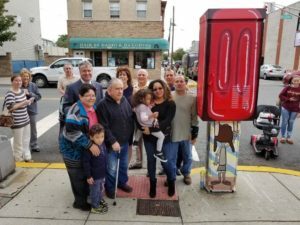 Another utility box turned into street art on Broadway in Bayonne. The challenge for the business district has long been its size. The Broadway commercial district is more than two miles long and was not designed for today’s online shopper. The plan is to divide the commercial district into smaller hubs centered around the light rail stations. The 22nd Street area is the first to begin development, but the others are soon to follow, with plans already approved for several buildings near the 8th Street station and one under way on Broadway and 45th Street. 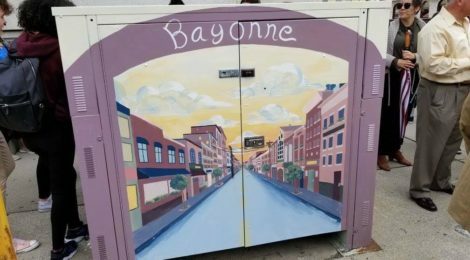 Bayonne is truly more than just a bridge. It’s a city with a strong history of community. It’s a peninsula tucked away in a corner of Hudson County with great parks, views and the potential for waterfront amenities. 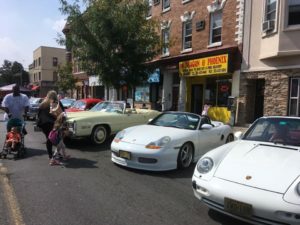 Like many postindustrial municipalities in New Jersey, it is figuring out how to transform itself into a community for the next century without losing its identity.